In case the picture doesn't make it clear, the leaf are covered in little spots, most of which are tiny holes straight through, and a few of which are only specs of brown. One plant has every leaf looking like this, and a few have a couple of good leaves but the rest speckled. Some of my potatoes aren't affected at all. They're not like any disease spots I've seen before, because of the holes. Usually I've just seen browning and withering. They're also not much like insect damage I've seen before, but I suppose little insects could bore holes right through like this. Maybe it's something else entirely, like inadequate fertilization or incorrect pH? Oh, one more thing -- it's been incredibly rainy here for the past week or two. Looks like Potato Flea Beetle to me. Give it a Google. 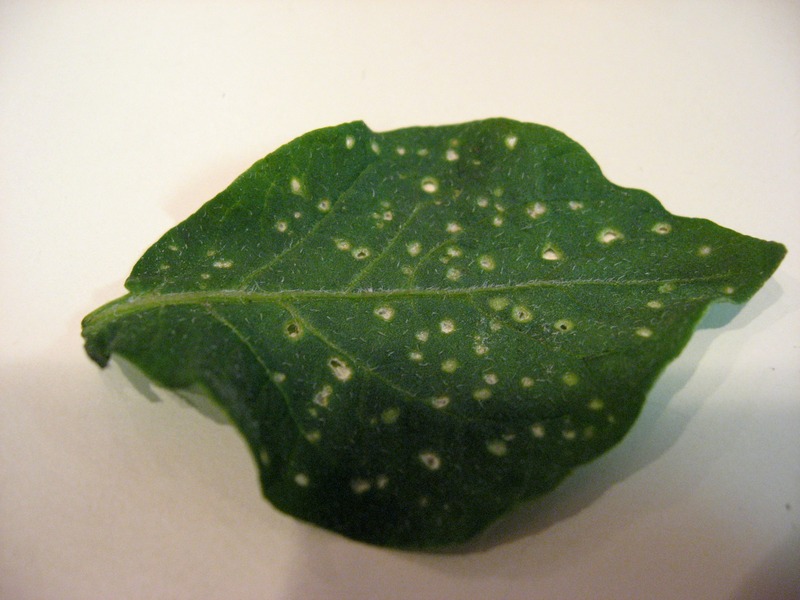 yup, I was thinking flea beetles too... Soapy water spray should be good against them. Bingo. You guys nailed it The phrases "very distinctive pattern of damage" and "shallow pits and irregular holes" fit precisely. This must be what nearly killed the broccoli I sowed in the garden. The established plants seem not to care much about being riddled with holes. My reading says not to bother with pest control for plants with 4 or more leaves, because they'll tolerate the feeding, and I think they're right. I'll just keep an eye on things for a few days. I'm so glad it's not disease! Look for a small black beetle. They are alert and scamper if you approach. The darned things like potato, radish, turnip and cabbage. I call them flea beetles. Some call them click beetles. Whatever their right name, they are a pain. If not controlled, I have seen them ruin a crop. The trouble with trying to hit them with soapy water is they take off as you approach as I said. Maybe you can outrun them? Have fun! Yeah, I've definitely seen black beetles that match the pictures. I was under the impression that soapy water spray would make the beetles not want to eat the leaves, not that I had to try to spray tge beetles themselves... Jal, what technique do you use against flea beetles?